This homemade molasses cake recipe with whipped peanut brittle filling is outstanding. So moist and dreamy. 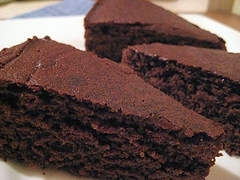 I offer many more homemade cake recipes for you to try above and at the bottom of the page. Old fashioned dessert recipes just like Grandma used to make. Make this cake the day before you want to serve it. Cream butter and white sugar together for 5 minutes. Add well beaten egg and molasses. Sift flour before measuring. Add salt and baking powder; sift again. Add baking soda to buttermilk and add alternately with dry ingredients. Add vanilla. Pour into prepared cake pans and bake for 25 minutes. Remove from tins after 10 minutes and cool completely. Put layers together with filling and pile the rest on top. To make filling, force enough peanut brittle through a food chopper to equal 1 cup. Fold into the stiffly beaten sweetened cream.